I love Kamandi. The original series from the 70s is my favourite work by Kirby. But then, I was always a huge Planet of the Apes fan. For many years I have longed for DC to revive the series, and one of the more interesting touches in this book comes in the text page, as they explain that so many writers have had ideas about how to revive the series, but DC could never decide which one to go with. On the other side, I was not a huge fan of DC Challenge, when that came out back in the 80s. I enjoyed the notion of having various writers and artists on the book, and leaving cliffhangers that the next creative team would have to resolve. But the element of having to constantly bring in other characters prevented the story from ever really moving forward. 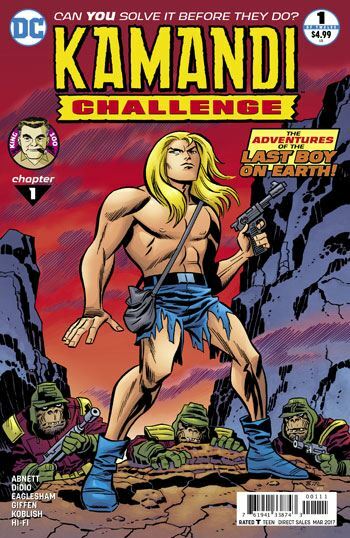 Kamandi Challenge brings back the best ideas from DC Challenge, and sheds the worse ones. In this miniseries, each issue will be by a different creative team, once again having to resolve the cliffhangers set up by their predecessors, but it all happens within a continuous tale in a new version of the Kamandi universe. Dan Didio and Kieth Giffen do a superb job opening the story. It seems as if we are seeing Kamandi in a happy existence long before the Great Disaster, but then find out that this is not the case at all. Delightfully, the illusion is shattered when giant talking rats burst into his artificial world. Kamandi is given a few hints about the larger reality outside the one in which he was raised, but much of that is left to be explored in the rest of the series. We do get to meet some of the classic characters from that strip, including Great Caesar, Prince Tuftan and Dr. Canus. There are also some delightful cameos by Jack Kirby and Mike Royer, the original creators of the character. This first issue contains the first two chapters, so we get one cliffhanger set up by Didio and Kirby, and then the resolution by Dan Abnett and Dale Eaglesham. Giffen is great at creating art that is evocative of Kirby, and while Eaglesham doesn’t even try to go that route, his renderings of Kamandi and the tigers is just beautiful. This issue was a lot of fun, and the series looks to be a promising ride.